Gaza (along with the West Bank and East Jerusalem) is occupied Palestinian territory under international law , determined by the vast majority of the world, as well as the highest court in the world, the UN's International Court of Justice. Gaza cannot commit aggression against Israel, since Israel is in constant and continual commission of illegal aggression against Palestine by occupying it (illegally and sadistically blockading it and frequently committing terrorism against its civilians, including by targeting them with chemical weapons provided by US taxpayers - see " Rain of Fire " by Human Rights Watch). As documented by Amnesty Int'l, Human Rights Watch, and many others, Israel intentionally targets and murders civilians, including children, en masse. Israel also kidnaps and tortures children , including by keeping them in outdoor cages, over night, in winter. On May 20th , the Israeli government murdered 2 unarmed Palestinian teens, one on video , and wounded a third. The firing of pathetic scrap metal rockets from impoverished Gaza, which have killed no one, were in fact launched in response to earlier Israeli bombings, killings, assassinations, and arrests of Palestinians, including children. Since the year 2000 , Israel has killed 1,500 Palestinian children, while Palestinians have killed 132 Israeli children. That means Israel has killed over 1,000% percent more Palestinian children than vice versa. As documented by the Washington DC based non-Profit, The Jerusalem Fund, Israel breaks far more ceasefires than Palestine - this includes firing of the Palestinian scrap metal rockets. Israel has violated more UN resolutions than any other country. That includes Iraq under Hussein. Hamas is the government elected by Gaza in elections that Jimmy Carter (and many others) observed and said were completely fair and free. Israel constantly says Hamas uses human shields. But in Israel's biggest massacre of Gaza, the one in 2009, all the human rights organizations, including Amnesty, HRW, and the jurist Richard Goldstone, found that Hamas DID NOT use human shields. On the contrary, Israel used human shields , which is a regular practice for Israel. Israel uses civilians as human shields. Israel forced Palestinian civilians to dig and lay naked in trenches around Israeli tanks. See here at 6:45. "The Mission received allegations that in two areas in north Gaza Israeli troops used Palestinian men as human shields... The Mission found the foregoing witnesses to be credible and reliable. It has no reason to doubt the veracity of their accounts and found that the different stories serve to support the allegation that Palestinians were used as human shields." In the history of all rocket and mortar fire into Israel, 26 people , total, have been killed. And remember, Palestine breaks ceasefires far less often than Israel, as documented above. This number of 26 is in contrast to the minimum number of 1,400 people who were murdered by Israel in a single one of its terrorist atrocities, the 2009 Gaza Massacre. The rhetoric and tactics of Hamas and other groups resisting Israeli occupation and colonization can be brutal ( though far less so than Israel ). Propagandists try to attribute this to anti-Semitism, to distract from the fact that these groups are resisting having their country stolen and their people dispossessed and annihilated. Native American resistance to European colonizers was sometimes extremely brutal, as was their rhetoric, but everyone universally recognizes that this was not because of "anti-White-ism", or "anti-European-ism", but because they were having their land stolen and their people massacred, the same thing that Israel is doing to the Palestinians. Palestinians have the right under international law to resist occupation, ethnic cleansing, colonization, aggression, and annexation. Miko Peled, son of an Israeli general, recently stated that if Israel doesn't Like rockets, they should decolonize Palestine. Dr. Norman Finkelstein notes that " The Palestinians have the right to use arms to resist an occupation . However, the fact that morally and legally they have that right doesn't mean that it's the most prudent strategy. In my opinion, a national Palestinian leadership committed to mobilizing nonviolent resistance can defeat the Israeli occupation if those of us living abroad lend support to it." Obama requested more military aid for Israel than any president ever . Israeli settlement building in Palestine is a war crime under international law. Under Obama, Israeli settlement building is up over 130%. Palestinians are brutalized, repressed and impoverished by Israel . To get a quick visual understanding of the difference between Gaza and Israel, take a look at the images of people and cities being wantonly pummeled by Israeli terrorism when you search the word " Gaza ", and the images of opulence, wealth and luxury that come up when you search " Tel Aviv ". Israel has an illegal stash of hundreds of nuclear weapons. Israel, whose government intentionally targets, tortures, and murders civilians, including children, including with chemical weapons, and whose government uses Palestinian civilians as human shields, and whose government is the last entity on Earth carrying out old-style ethnic cleansing and colonization of foreign countries, is the single biggest recipient of US aid , at over three billion dollars a year and huge amounts of lethal weaponry such as attack helicopters and white phosphorous chemical explosives. To reiterate, Obama requested more military aid for Israel than any president ever . This is not because Obama and the USA love Jewish people. Obama was recently an accomplice in a literal neo-Nazi -led coup d'etat in Ukraine, and is currently fully supporting the junta-integrated Ukrainian government, which is staffed with several neo-Nazis in high ministries, and which uses neo-Nazi paramilitaries to carry out massacres ( and possibly genocide ) against people resistant to the junta. The actual reason the US supports Israel is discussed below. As Amnesty International has noted , all aid to Israel is illegal under international (and US) law, because Israel is a consistent violator of human rights. Amnesty International also noted that Israel's 2009 massacre of Gaza would not have been possible without the illegal funding (money and weapons) and support Israel gets from the USA. This is also true of the current massacre Israel is committing in Gaza. However, in a way, that is good news. That means US citizens can STOP the massacres. If we stop our money and weapons-flow to Israel, which is illegal anyway, we stop Israeli terrorism! All we have to do is stop committing a crime, and we will stop more crimes! That's great news. Here is a previous example of how this has worked: When the USA cut its funding for Indonesia's genocide against East Timor , which the USA was funding almost exclusively, Indonesia was forced to stop and withdraw. All it took was cutting off our illegal flow of money and weapons to the criminals. The same thing would happen if we cut our illegal funding for Israel's genocides and acts of terrorism, ethnic cleansing, colonization, and annexation against Palestine. But since the USA is an anti-democratic country, the only way to stop US plutocrats from using our money to fund Israeli terrorism is to force it through massive, non-violent pressure . One way it happens is when it becomes too politically costly for the plutocracy to keep funding genocide and terror, meaning the costs of their illegal support outweigh the benefits, as in Indonesia. In that case, massive publicity and indigenous resistance accomplished the goal. But Israel is the USA's main imperial - and nuclear - base for controlling the Middle East, which US planners, in 1945, called the greatest material prize in world history, due to the oil and gas. Thus, it might require more, as in non-violently making our country into a democracy so that people control their own institutions and money, and thus the way we operate as a society and interact with the world. 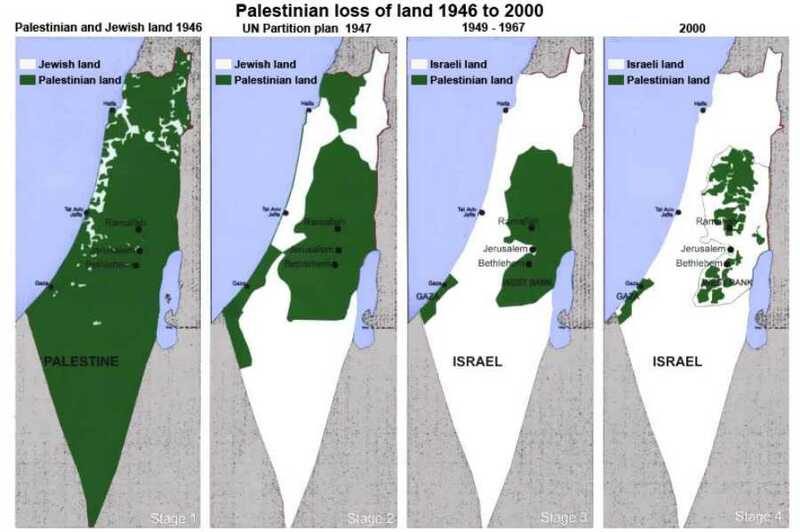 Last note: To be clear, Israel is a legal state, but only within the borders allotted to it by the United Nations - the Pre-1967 borders, which existed before Israel started eating away, through terror, ethnic cleansing, colonization, and annexation, at the areas reserved by the United Nations for Palestinians, as well as areas of other countries, such as Syria (the Golan Heights). Per international law, US domestic law, and common sense, Israel doesn't deserve any support until it abandons isolationism and accepts that it can't steal other people's countries, and stops blockading and withdraws its soldiers and settlers, all there illegally, from those countries. Israel is, militarily, the most powerful country in the Middle East, by far. Removing our support for the Israeli government (which we are legally required to do) will not put Israelis in danger. It will pressure the Israeli government to stop doing what endangers Israelis, which is committing aggressive acts against Israel's neighbors. If Israel ends its status as a consistent violator of human rights, decolonizes Palestine, and respects its neighbors, it could be a pleasure - and legal - to work with and support Israel. Germany, Japan, and South Africa went from being the most reviled countries on Earth to being some of the most admired. Maybe Israel could undergo the same transformation, but not unless we, US citizens, help by ceasing to enable Israeli terrorism and war crimes by illegally supporting them. Robert Barsocchini is an historical researcher, investigative journalist , and writer for the film industry.